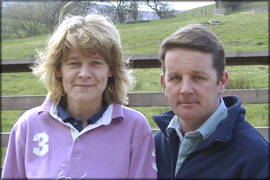 Equine Pasture Maintenance is a farming-led, family business, run by Liz and Miles Greenwood offering a complete paddock maintenance service based and operating around the West/North Yorkshire and Lancashire border area. Miles is a third generation farmer of beef and sheep and a past winner of both the Meat and Livestock Commission and British Grassland Society Beef from Grass competitions. Liz has worked with and owned horses all her life and has competed at pony club, riding club and county level in many disciplines. Their combined experience gives them a full understanding of paddock maintenance and all its related issues. The business began in response to requests from friends and neighbours, many of whom kept horses, who needed their pastures tended and maintained. they now have a thriving business based on their professional and friendly, reliable service. Whatever the size or special requirement of your land, Equine Pasture Maintenance will give you the same high level of care as our existing clients. Please follow the link below to find out more about Pasture Management; alternatively you can contact us using the link on the main menu above.